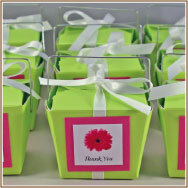 bride.ca | DIY Wedding Favour Kits: Fun Assembly Required! DIY Wedding Favour Kits: Fun Assembly Required! DIY (Do-it-Yourself) wedding favours can give you the chance to personalise and be more creative with your wedding favours and save money - but only if you pick the right ones. For example, paper-made favours allow you the chance to add personal touches such as ink stamps, beaded stickers, or other scrapbooking elements, unlike favours made of plastic, glass or metal. Don't assume that a DIY wedding favour kit is always the more affordable option; it's a good idea to factor in all of the costs - including extra contents, accessories or supplies you might have to purchase separately. Are DIY Kits Easy to Assemble? This takeout box or "purse" kit makes a perfect wedding favour when stocked with candies, chocolates, or other goodies for your guests. Each kits comes with 25 takeout boxes, 25 satin ribbons, and 25 pre-printed labels which come with a number of highly-customized options - you get to choose the style and colour of the label and the label text, as well as the colour of the ribbon and the box. The boxes themselves are pre-assembled, so all you need to do is attach the labels, ribbon, and add the contents! The cost for each kit of 25 is $45.00 CAD. 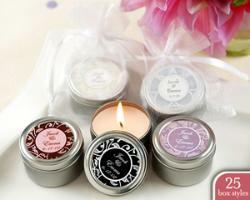 In Casa Gifts carries these lightly scented candles in tiny tin pots, which also come in elegant organza pouches. You can choose from 25 different styles of labels that include the couple's name and date, which you then apply yourself to the tins once the kit arrives. Each candle is roughly 2 inches wide and 1 inch tall, with prices ranging from $2.44 CAD each for orders of 144+, and $3.24 CAD for smaller orders of 1-47. WhimsyWraps.com sells a wide selection of customizable chocolate bar wrappers, which you fit over Hershey's® Miniatures assorted chocolate bars (Milk Chocolate, Krackle, Special Dark, Mr. GoodBar) yourself! 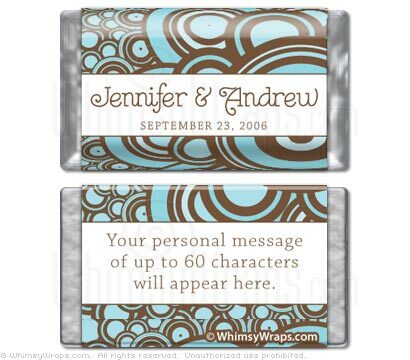 Wrappers come printed with the couple's names and date, as well as a personal message of up to 60 characters. This design, the Pearls Mini, ranges from $0.30 to $0.35 CAD per wrapper, depending on the quantity ordered, and also comes with free shipping on orders of over $75 CAD. Like the takeout box, this sweet favour "suitcase" tin is also a DIY-job where the contents are concerned. However, unlike the takeout box, there is no ribbon to attach - and each tin already comes with a "Thanks for Making the Trip! "tag, perfect for destination weddings. With tiny wheels that actually roll, a pull-up handle, and retro travel stickers, this is one favour that won't get left behind on the table after it's been raided for candies! 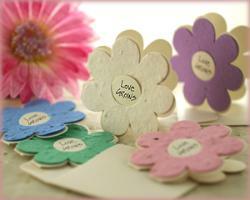 For added customization, the couple's names and date can be printed on a label and applied with the other stickers. Each tin is $2.55 CAD plus shipping. 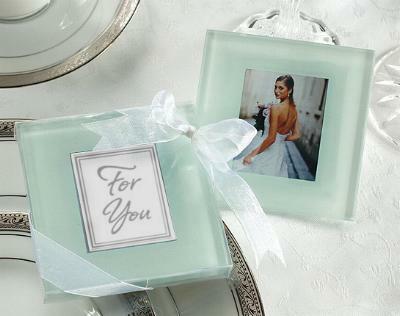 This set of two frosted glass photo coasters is tied with a sheer organza ribbon and comes with a pretty "Thank You" tag. The great thing about these favours is their versatility - you can include a photo of the bride and groom in one of the two coasters and re-wrap the set in ribbon, or you can separate the coasters and included a photo in each - perhaps printed with the couple's name and date across the picture. The coasters also feature pads at each of the four corners to protect surfaces. Each set of two is $1.95 CAD plus shipping. These daisy-shaped packet favours are embedded with wildflower seeds, to give your guests a growing reminder of your love. Each seed packet comes in a cream envelope, with space for you to attach your own labels bearing the couple's name and date. You can also enclose "Thank You" notes inside, stamp heart-shaped designs on the outside, or get creative in any other number of ways. Sets of 12 range from $20 CAD per 12+ sets, to $26.59 CAD per 1-2 sets.